In the "Ditching at Sea" forum, Reply #23, Chuck provides "Vent_Lines.jpg" photo that shows a row of objects on the tops of the tanks approximately in line with the Mystery Rods. There are three objects visible. A 4th one may be underneath the raised platform on top of the aft tank, and may be the reason for that particular platform to be raised higher than the one that extends along the tops of the forward 3 tanks. The purpose of the aft platform seems to me to simply provide a place for someone to climb on top of the tanks without putting a knee directly onto the tank top. Once on top of the tanks, someone could crawl forward on the narrower, and slightly lower, forward platform. That much I believe is obvious. I would suggest that the objects are the fuel lines from each tank, and manually operated valves were either already in place, or were added later. Access to the valves, if already in place back then, might have been by reaching or crawling to within convenient reach. Practical experience might then have shown this to be impractical, especially if only two people are on the a/c, leading to the use of the Mystery Rod actuators so the pilot could control fuel. But the fuel diagrams show three interconnected rotary valves that move through the entire 360 degrees. Assuming these rods are actually torque tubes with handles, it would not be possible to hook fuel valves to them and be able to rotate the connected valves through 360 degrees. 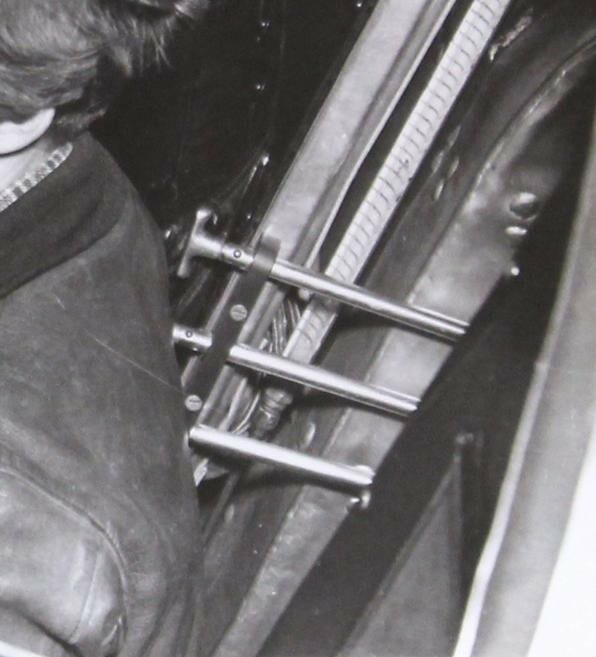 But these valves were supposed to be placed within reach of the pilot on the cockpit floor so another reason the dismiss these rods as being activators for the fuel selector valves. Were these dump valves so that the fuel could be jettisoned in case of an engine failure so that the plane might be able to fly on only one engine? If they were dump valves then using them improperly could have accidentally lost fuel but this seems unlikely since you would expect the controls for that to have some safety guards over the controls. Still scratching my head. It's interesting that in the left photo you can see the Cambridge analyzer mounted above the instrument panel below the compass and in the second photo it is gone. I have attached a blow up of the Cambridge. Take another look at your photo's and compare the compasses they are different as well. At http://tighar.org/Projects/Earhart/Archives/Research/Bulletins/51_HeatShields/51_DetectiveStory.html is a photo of the fuel tanks early in their installation. The top platforms are not present, but the area where the fuel lines attach to the tanks are lost in glare. If someone has access to a high-resolution version of the same photo, perhaps it will help us guess what the rods might have connected to. Speaking of heater ducts, just what kind of heater did they have, was it a Janitrol or was it steam heat like in a DC-3 or something different? Boy oh boy - did you ever just open another Pandora's box. I'll give you the lowdown tomorrow. Ric u cant do that. Boy oh boy - did you ever just open another Pandora's box. Sorry to make you wait Richie. The system the Lockheed Model 10 used to keep the crew and passengers warm was not sophisticated. The hot air in the heating ducts along the base of the cabin wall came from cuffs around the engine exhaust manifolds. The manifolds got hot which warmed the air in the cuffs which then circulated through the ducts. Once everybody who's interested has had a chance to read it, I'll bring you up to date on what we've learned since then. TIGHAR member Leonid Sagalovsky successfully researched the fate of Lockheed 10E Special NR-16059 "Daily Express" after it was sold to the Soviet Union. Factory No. 156 is the famous Tupolev Design Bureau, now a government-owned Tupolev Corp, in Moscow. A historian on Tupolev's staff provided information that the factory made detailed drawings during the Electra's disassembly. We followed it up and traced the Tupolev report on the "Daily Express" to Moscow Aviation Institute (MAI). An inquiry to MAI confirmed that the report exists in their library and contains photographs taken in 1939. I was able to obtain copies of some photos, but the full report remains inaccessible due to (irony of ironies) the US State Department sanctions on MAI in connection with "WMD proliferation activities." So, I'm afraid the fate of NR-16059 is very much known and it is Aeroflot spare parts." We are currently trying to get the State Department to waive the restriction so that we can get the full report. also if u look at this image if the floor was designed for easy access why put ply boards on it ? The "dado" IS the heat shield. The hypothesis is that the structures we found are not dados at all but insulating barriers between the heater ducts and the tanks. I think there's room there. the heat shields (itf that's what they are) are very thin. We know from the example of Alaska airplane that there has to be some kind of insulation there. The floors of all Electras were plywood. In looking at these photos (not necessarily presented here in order they were taken), I think the door may have been able to swing closed and be latched shut. In the first photo, note what appears to be a cutaway relief in the edge of the door at the lower left hand corner of the photo (we only see the lower radius of the cutaway feature at the bottom corner - the door handle is at left center and what appears to be the window in the door is seen in the left upper corner - the window/latch position locations are more clearly seen in the second photo). This cutaway additionally allow for clearance of the door and the "midshaft handles" on the rods when closing or opening the door. Also it appears that the cutaway in the door matches the flange through which the mystery rods pivot at the distal end. Though matching in profile, it does not appear that the flange and the door cutaway engage each other when the door closes as the door appears to stop aft of the pivot flange as seen in the the third photo (aft of the sight tube). It appears that when the third photo was taken, the relief was not yet cut into the door as the door appears to be pushed closed touching the mystery rods (note what appears to be a "document" or placard on the cockpit side of the door revealing the position of the door - airworthiness certificate perhaps?). I do find it interesting that it appears that the mystery rods can be actuated by the handles on the cockpit side of the doorway but also with handles on the cabin side of the door as well unless those aren't handles. If they are handles that are attached midshaft, the handles would limit the rotation of the rods to about 90 degrees of motion before running into the adjacent rods. 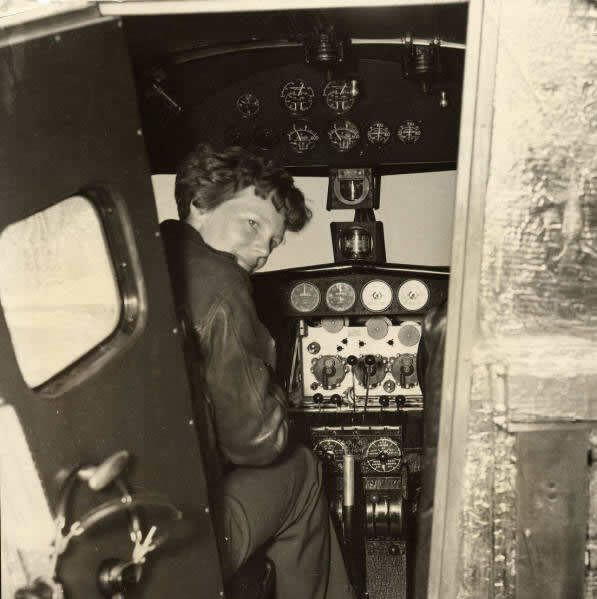 And as to the idea that the rods operated the fuel valves, the first photo shows one of the in floor fuel valves, Earhart's right foot is on part of it. In photo two you can see two more fuel valves on the instrument panel below the throttles.